We just hit the second quarter of 2019! So far we’ve accomplished many of or goals for the year. We’ve expanded our service area, offerings, and services. Let’s explain a little more about what we’ve been up to. We continue to post almost daily on Instagram and Facebook to allow customers to see examples of our work. We don’t like stock photography! Lock Alchemy provides services that people can see so we want to show them photos. 2019 is offering a lot of networking events. Hopefully we’ll see you at the next event! Continued investment in our inventory has allowed us to provide same day service for unusual lock and key needs. We stock hundreds of different key blanks, locks in different finishes and key ways, and commercial lock and door hardware. This year we started provided Safe Deposit Box services. Our experience in different locks has made this an easy addition. We look foreword to networking and services more banks, credit unions, hotels and other buildings with secure storage. The biggest thing we’ve done in 2019 (so far!) has been adding a new service location. We are proud to have a branch in Lakewood, OH. This branch allows us to service the far West Side of Cuyahoga County and the Eastern portion of Lorain County. It also allows us to more easily service Cleveland proper. Lock Alchemy is licensed by GMS to be this areas provider of MX12 restricted locks, cylinders, and keys. The closest locksmith with access to these keys and locks are in McKinley New York. “DO NOT DUPLICATE” stamped on keys is becoming increasingly irrelevant if not deceiving. There is nothing illegal to stop anyone from duplicating a key stamped “do not duplicate.” Most hardware stores will duplicate these keys without ever examining them. The presence of DIY key machines in grocery stores allows people to simply place the key in the machine and produce copies. There are now even apps that allow copies of keys to be made by picture, thereby removing the need for a key to be taken off the premises of a building. Lastly, unscrupulous locksmiths will duplicate many “high security” keys for a quick dollar. Our MX Restricted Key System controls things from the source. A contract and initial purchase are necessary to have access to these keys and locks. Additionally, they are geographically restricted. Each key blank box is also factory labeled identifying the locksmith it was shipped to. This key system also allows for the flexibility to be master keyed and used in various types of door and lock hardware. Incredible versatility, durability, and affordability. Unlike other restricted key systems like Medeco, Mul-T-Lock, and ASSA – MX is very affordable for small businesses that don’t want to skimp on security but don’t want to pay high dollar for brand names. Per our contract with GMS and our suppliers we must stamp all keys with a company identifier. 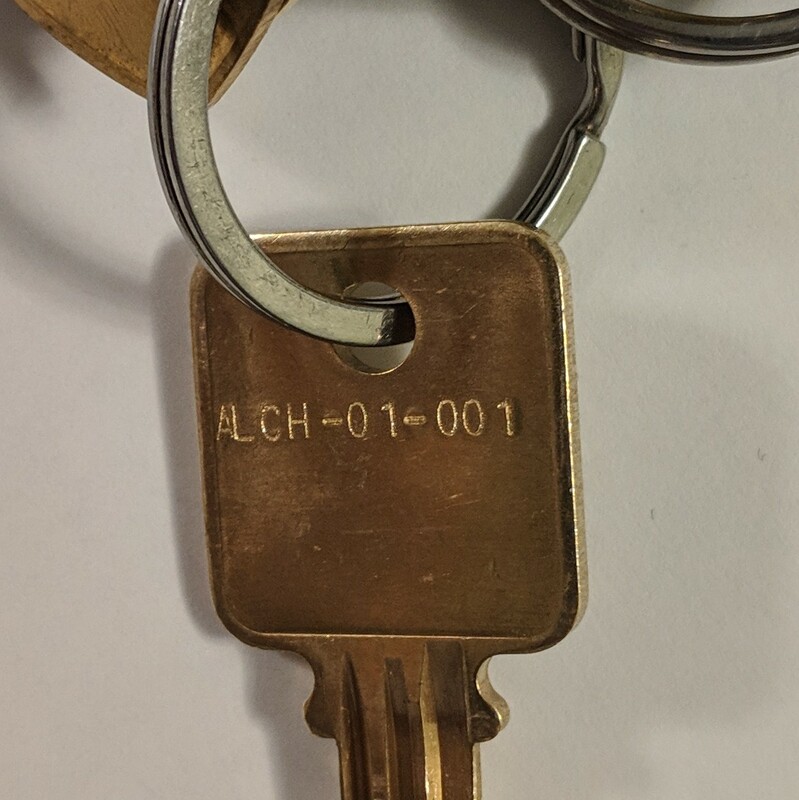 We stamp keys with “ALCH” to represent our company. The second number designates the number your key system has been assigned. The third number represents the individual number assigned to each key. Even if multiples of a key is made each key will have it’s own identifying number. 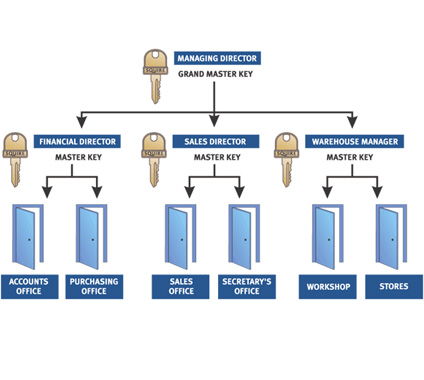 Each key is tracked within our system reducing the cost of lockouts and key duplication. In many cases, we can simply ship keys to authorized personnel. Contact us today to learn more about how we can implement MX at your business or home. We can provide an in person demonstration and quote at no cost to you. Lock Alchemy Locksmiths offers a range of high security key systems and master key system options. We walk customers through selecting a system, implemention, and any ongoing maintenance. We have several systems in place to help businesses manager their keys. Our high security keys are stamped for identification. We also provide stamping services for master key systems. Our professional software allows us to safely store and manage your master key system to provent issues with lost keys, changing locks, hardware upgraded, security changes, room use changes and the like. Our combination of offline computer software and paper systems offer redundancy, security, and peace of mind to customers. Our system ensures that unauthorized individuals will not be able to duplicate keys from us. We also provide solutions for businesses, management companies, and HR departments to track keys and user access. This article is a continuation in a series about our high security and master key system product offerings. Do Not Duplicate, Copy Right, All Rights Reserved. We’ve seen these phrases everywhere yet people still copy keys, pirate software, and share music illegally. Key Control is the idea that only certain individuals have access to certain types of keys. They can be restricted to locksmiths, distributors, geographical areas, and end-users. Locksmiths that have accounts with certain distributors are able to purchase lock cylinders and key blanks distributor limited keyway. While this adds a layer of complication to getting a copy it’s far from full proof. These blanks are often available online from many dealers. There are some locksmiths that will over look securing appropriate documentation before duplicating these types of keys. Real restricted key systems require a locksmith to buy in to a product line. This ensures that only locksmiths who’ve spent large sums of money are able to make key copies. Medeco is one of the biggest names in lock security. If you’re looking to improve your security a known name like Medeco may be your first choice. Medeco is a great company and they offer many excellent products, however, switching to a new lock system can be confusing with Medeco. Part of that confusion is by design. People invest in Medeco locks for security and key control. Hardware stores don’t have the machinery to duplicate keys. The blanks require special dealer agreements to get and locksmiths will only cut them with proper identification card and paperwork. Different key blanks add to this difficulty. 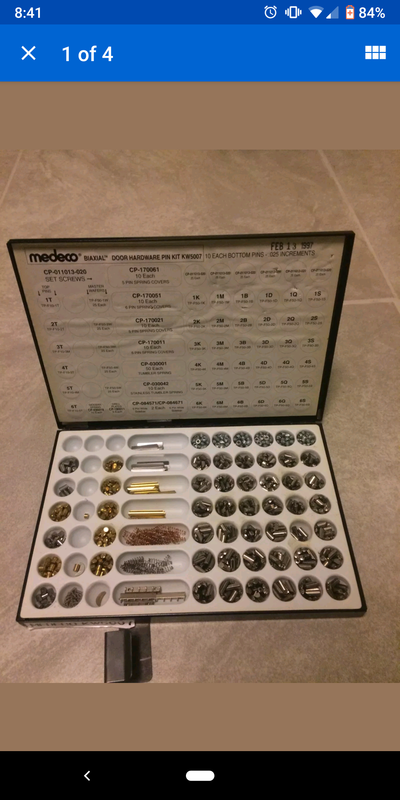 Medeco offers a variety of different key systems. Original, biaxial, M3, X4 etc. The pros and cons are determined by the specific user application. While all Medeco locks are top quality some of them are not drill resistant. Got true high value / high security applications drill resistance may be a necessity. Older Medeco systems have expired patents and key blanks are readily available. If you’re thinking of upgrading to a high security lock system call Lock Alchemy Locksmiths at 216-505-1389. We can walk you through the selection and implemention process. 2018 has been incredible year here at Lock Alchemy Locksmiths. We’ve grown our business in every sector and have significantly expanded our product offerings. Residential: We’ve teamed up with national home warranty companies to offer rekey services. Many of our customers are just moving into their new home. Some homes were occupied by the owners and some were rental properties. Either way they’re satisfied to know that they’re the only ones with the keys to their home. Residential New Locks: We continue to stock, install, and service more mechanical push button locks. They often aren’t as easy to install on older does than people would imagine. It’s our privilege to make adding a combination lock an easy process. Property Management / Real Estate: This year we’ve expanded our client list with more property managers. Lost keys, door issues, hardware replacements. We’ve done a lot to ease the process of managing multiple properties for investors and managers. We’ve also partnered with several real estate agents to be their preferred locksmith. Commercial: Perhaps our biggest area of growth this year has been in the commercial locksmith sector. We’ve installed commercial grade door hardware including lever sets, door closers, and panic hardware, as well as repaired many doors. Master key systems have helped businesses rent out office space and continue to maintain access for service staff. Social Media: We’re continuing to post job site pictures, completed projects, and helpful tips on Instagram, Facebook, and Google Business. High Security & Restricted Systems: Businesses often have a need for a locksmith to provide master key systems and high security locks. We’ve significantly expanded our offerings of high security locks. We offer popular brands such as Medeco, ASSA, Mul-T-Lock, and our own regionally restricted keyway. The closest locksmith in any direction that has access to this key is in New York State. We’ll be posting more about specific lines, systems, and benefits. 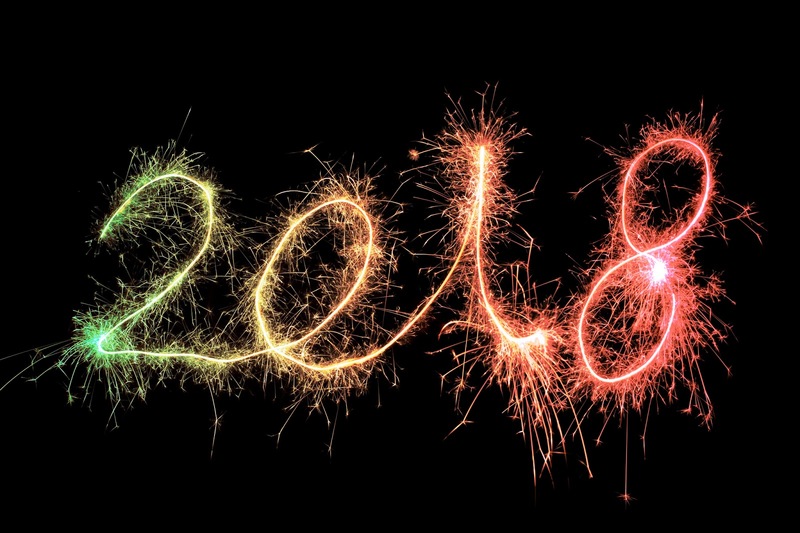 Thank you all for a wonderful 2018 and we’re looking to make 2019 the best year yet! Happy New Year! Recently a large institution reached out to us to change a standard commercial lock to a pushbutton lock. Initially we assumed that the installation would be relatively straightforward. Remove the existing lock, set the new combination, install the new lock and we would be done. Upon removing the existing lock we discovered that the lock was not drilled out and a typical fashion. Normally a lock for a commercial application will have through bolts. These are extra bolts they provide additional security and strength to the lock. However, this lock was drilled out larger than a standard lock and had holes drilled for through bolts. The interesting thing is that this lock did not have through bolts. So essentially, They drilled these extra holes for no reason.They drilled these extra holes for no reason. 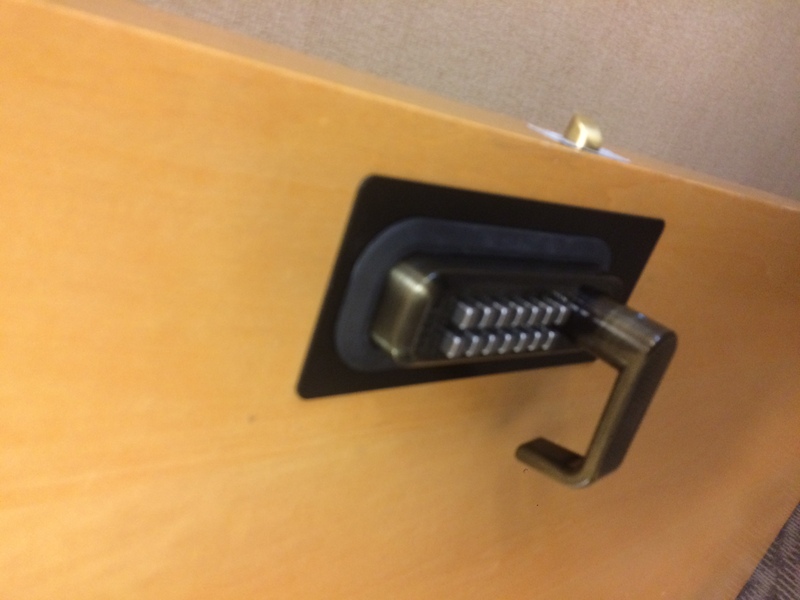 So we couldn’t simply install the new lock as planned. We started looking around for wraps and plates that would cover these holes, maintain aesthetics, and be cost effective. We soon discovered that the company actually has a solution for this exact problem. We used the plates designed for a lever locks by Lockey. The installation required the drilling of a new hole for a supporting screw. The whole who is precisely drilled using a custom to jig and clamps. The code was sent prior to arriving in order to decrease the amount of time required to be on site and interfere with normal hours of operation. After the lock wasn’t installed we train the staff on how to use the lock, especially the passage function. At the end of the day I believe we provided a cost-effective solution for this company. We were happy that they were just as pleased as we were. Unfortunately, sometimes evictions are necessary. Lock Alchemy has experience working with property managers, banks, bailiffs, and court appointed agents. We’ve complicated evictions throughout Cuyahoga County including Cleveland, EastCleveland, South Euclid, Cleveland Heights, and University Heights. Evictions can be complicated. Don’t get caught off guard- choose a locksmith company with experience. Our services simultaneously decrease time to gain entry, change locks, and increase safety. Cleveland Heights is a popular city and thriving city. The city’s population was 46,238 in the 2010 census l. As of the 2010 census, Cleveland Heights was ranked the 8th largest city by population in the Greater Cleveland metropolitan area and ranked 20th in Ohio. Cleveland Heights boasts several older style mansions that are incredibly impressive. Maintaining original doors and door hardware is a difficult task. Lock Alchemy works with owners of these homes to update the function and look of their hardware while maintaining an older style aesthetic. Cleveland Heights also has many rental properties. Propert management companies and individual landlords use locksmiths to fix doors and locks and change the key between rentals. Cleveland Heights is also the home of many small businesses. One area that hosts several small businesses is the Coventry area. Coventry has many small trendy stores, restaurants and other more commercial businesses. Locksmiths change out locks between tenants of commercial property. They also change locks if an employee is fired or quits. They also fix and repair commercial doors and hinges. Locksmiths can also provide other security services to small businesses like master keying, padlocks, security cameras, drop safes, file cabinet locks, and regular safes. Evicting tenants is not an easy thing to do. Of course, no one wants to be responsible for removing someone from their home. The legal fees, time, and hassle required can create stress and financial burdens. Bailiff and sheriff assisted evictions can make landlords and real-estate professionals uneasy. We strive to make the locksmith part of an eviction as easy as possible. We coordinate with local law enforcement and legal entities to ensure an eviction occurs legally. Lock Alchemy can provide full locksmith services during an eviction. We can gain entry to an occupied or unoccupied house. Remove the current locks then rekey them or replace them entirely. We can also gain access to garages, storage areas, and secure them with the appropriate padlocks and other security hardware. We can provide key duplication services on site and record the keys for future reference. After an eviction is complete we can also provide door repair and replacement services. Door services can increase the value of a home for sale or for rent. Our experience in coordination with real estate professionals, law enforcement and physical security allow us to provide cost effective solutions. 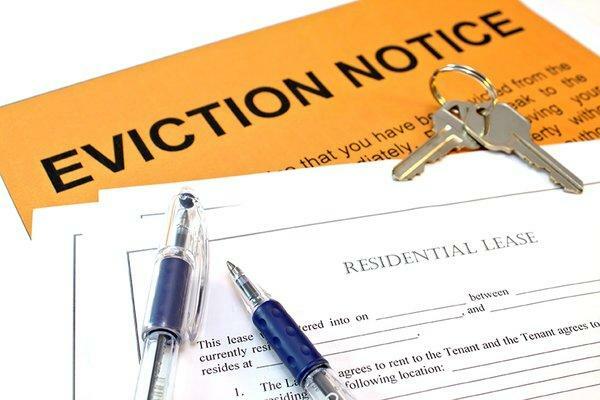 We are able to provide services for one or two evictions or a several in one day. Please reach out to use for more information.